Last month we attended the Sustainable Energy Technologies conference in Bologna Italy representing the TSBE centre at the University of Reading. 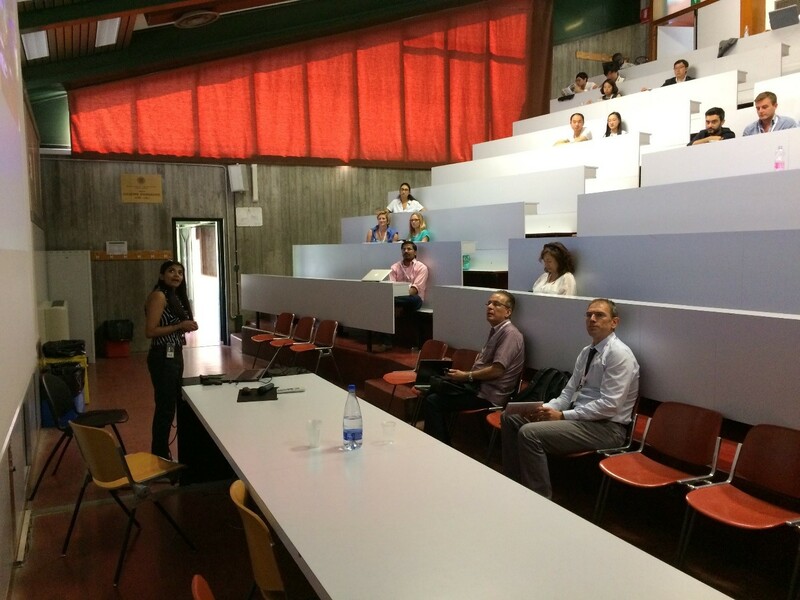 The 16th SET conference was held at the Alma Mater Studiorum Università di Bologna in the Department of Architecture and Engineering. Tuesday saw me (Kate van Someren) present my higher education classroom lighting and occupancy work looking at carbon emissions, power consumption and hours of operation metrics. Wednesday saw both Alice Gunn and Saadia Ansari present respectively on modelling power generation in Sheltland against industry and bespoke forecasting tools, and energy use profiles with energy waste analysis in a multi-use venue building. The conference was expertly organised by Professor Saffa Riffat Professor in Sustainable Energy and Head of the Institute of Sustainable Energy Technology at the University of Nottingham. We were welcomed on the first day with plenary sessions from Prof. Ardeshir Mahdavi, Chair of Building Physics and Building Ecology, TU Wien, Vienna (Austria) and Prof AbuBakr Bahaj Head of the Energy & Climate Change Division (ECCD), University of Southampton, Southampton (United Kingdom). Networking between presentation slots we fostered existing links to the Department of Architecture and Built Environment University of Nottingham with Prof Mark Gillott and Associate Prof Lucelia Rodrigues discussing the difficulty of accessing buildings for collecting energy data. The conference was good practice for us answering questions relating to our methods and findings prior to our viva examinations. The University of Bologna was very generous and welcoming, hosting us for our week and we were able to explore the city with organised conference events. Since returning from the conference both Kate and Saadia are submitting their conference papers as full journal papers to the International Journal of Low Carbon Technologies. This entry was posted in sustainability and tagged Emma Hawkins. Bookmark the permalink.